Guideposts Magazine featured “A Parting Gift of Love in their October 2014 issue. This is the story behind Susan Call’s moving story, “Secondhand Miracles,” which appears in A Cup of Christmas Cheer, Volume 4: Heartwarming Tales of Christmas Present. The article is reproduced with permission*. This writer knew all of her father’s stories—except the most important one. 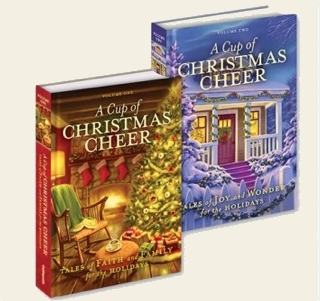 I’m a contributor to the Guideposts fiction collection, A Cup of Christmas Cheer. Even though my short story “Secondhand Miracle” is a product of my imagination, it has a clear real-life inspiration. Last year, I interviewed my dad for an oral-history project about his time in the Navy during the Korean War. Dad told me a story I’d never heard before—a story that I wouldn’t be here without. December 1950. Dad sat in the rear car of a train and watched the changing landscape through the window. He’d just finished boot camp at the Great Lakes naval station, in Illinois. Now he and the other young sailors were traveling to Newport, Rhode Island, to report for duty. The train clacked against the rails, lulling the sailors into a midday nap. But not Dad. His mind was lit up with the image of a beautiful girl with strawberry-blonde hair. Phyllis. Ever since their first date, over burgers and soda back in Pennsylvania—he was from Lewisburg, she was from Mifflinburg, and a friend had set them up—they’d been head over heels for each other. 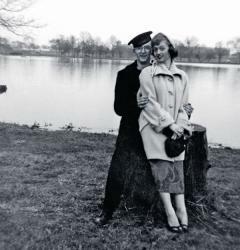 Even after he joined the Navy and she went to nursing school in Philadelphia, they stayed in each other’s hearts. He yearned to see her once more before he shipped out—and he had a plan to make it happen. The short call cost Dad nearly a week’s pay, but it was worth every penny. Phyllis promised she’d be there. Would she be able to make it to the station on time? Dad took a small box out of his pocket and opened it. Inside was a black lighter with a pink orchid painted on it. A Christmas present for Phyllis. The closer the train got to Philadelphia, the harder it was for Dad to sit still. He skipped dinner and stepped out the back door of the train, where he’d have a better view of the platform. He clung to the railing and waited. The whistle blew. The train lurched to a stop. The sailors were forbidden to disembark. Dad scanned the crowd. Where was she? Holiday travelers scurried about. Just as the crowd thinned, another train stopped, on the other side of the platform. A new wave of travelers filled the platform once again. “Phyllis!” he yelled desperately. Had he missed his chance? “All aboard!” the conductor called. Dad’s heart sank. He took one last look at the crowd. A flash of strawberry-blonde hair. There she was! “Phyllis!” he cried. Just then, the train’s wheels began to turn. It was leaving the platform. The movement caught Phyllis’s attention. Her eyes locked with Dad’s. Not a moment to spare. She darted through the crowd as the train picked up speed. Dad reached into his pocket and pulled out the little box. In one swooping motion, he lobbed it toward her. A tall stranger caught the box and turned toward Phyllis. “I believe this is yours,” he said. It was quite the spectacle. The crowd on the platform erupted into applause. The two sweethearts blew kisses and waved goodbye as the train pulled out of the station. Dad completed his mission. When he returned from duty six months later, he and Phyllis got engaged. They married and raised five daughters. I’m the youngest. Henry and Rose, the couple in the story, learn the most important Christmas lesson my parents taught me—that the greatest gift we can give each other is love. *“A Parting Gift of Love” by Susan Call from Guideposts Magazine is reproduced with permission from Guideposts, Guideposts.org. Copyright ©2014 by Guideposts. All rights reserved.